A great appetizer, snack, or even dessert! 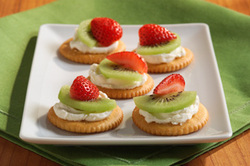 Spread cream cheese or ricotta cheese on each cracker. Top with fruit.